There are many options for breakfast depending on your food preferences, and that includes skipping the meal if you like the concept of intermittent fasting. Assuming you finish your last meal at 8pm and have lunch at noon the next day, this fits the standard 16 hour interval of intermittent fasts. But another method is to have an early dinner – or skip dinner, so you digest before going to bed, and in that case breakfast becomes very important. The other thing to consider is whether we’re getting enough fruits and vegetables in our diet. If you’re vegetarian or vegan that’s likely not an issue. But if you like to enjoy all foods, you may not get enough fruits and veggies. That’s where the fruit salad for breakfast is ideal. But it’s not just for this. When eating alone and at home you have perhaps the most freedom in choosing what goes into each of your meals. Very few of us fit that lifestyle: being both alone and home all the time. We travel. We go to offices. We visit friends. We eat at restaurants or the office’s kitchen. We cook for others. Others cook for us, but not just only for us. In those cases the cook has to think of doing something that works for everyone and that is tasty, not just looking at the pure nutritious elements. This means that lunches and dinners will likely include a variety of things. The upside to this is that your nutrition will have lots of different foods, each bringing to you its own nutrients. Centenarian Robert Marchand points out that each week he goes to get groceries he picks something different, so that he eats nothing in excess and misses no nutrient. “You have to constantly rotate the foods you buy and eat”, he says. When you’re eating with others and outside, it’s likely built into your routine – provided you pick something different on the menu each time. This is a subjective consideration in asking ourselves “am I getting enough fruits and vegetables each day?“. It depends on all the meals you are having, and what other foods you are having, in which quantity. The general observation of the research community is that most people tend to not eat enough of them. It’s simplified, and the answer depends on what you eat, specifically, versus what your body needs. Assume there are 3 meals during the day: breakfast, lunch, dinner. No snacking. If lunch and dinner give us limited options to increase the quantity of fruits and vegetables, then there is only one meal left to do that, and it’s breakfast. You can buy fruits you like at the store and keep them at home for several days. All you need is 10 minutes, a cutting board, a knife a bowl and a spoon. Early morning is a time you are likely to be home. You can make a bigger batch if you have kids and family members who enjoy them. Kids like it, as long as they can pick the fruits they like. For adults it’s not a free pass to eat anything for lunch and dinner, but you will at least know that one meal gave you the nutrients of fruits: vitamins, antioxidants and other raw/live food benefits. 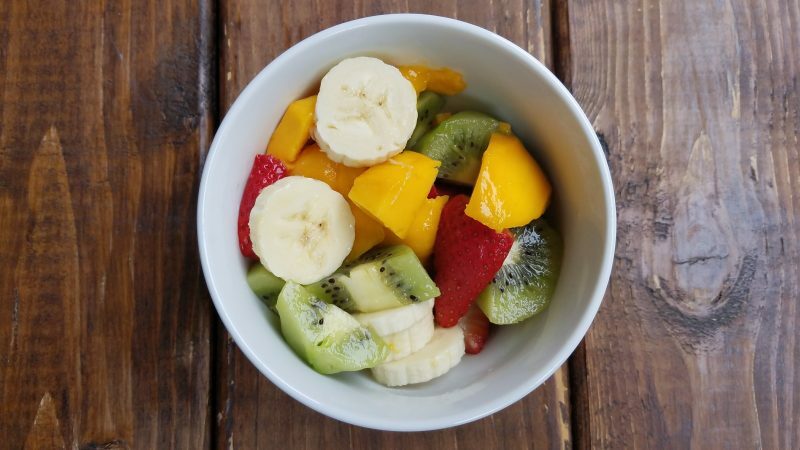 And if you’re looking for the absolute simplest, cut a few fruits you like and put them into a bowl. As simple as it is, it’s wonderful.